The year 1968 was a torturous year for the United States: the Vietnam War was raging and dividing the country, the Civil Rights Movement was exploding, and Martin Luther King Jr. and Robert Kennedy were assassinated two months apart. The year had been so tumultuous that Time magazine pre-selected “The Dissenter” as their Man of the Year. And then came the daring flight of Apollo 8. On Dec. 21, 1968, nearly 50 years ago, Apollo 8 was launched as the first manned spacecraft to reach and orbit the moon and return safely to Earth. The three-astronaut crew consisted of Commander Frank Borman, James Lovell, and William Anders — an Honorary Grossmont graduate of the Class of 1951, who went to Grossmont for two years, yet considers it his alma mater. Today, it’s hard to comprehend how the flight captured humanity’s awe. After Apollo 8’s amazing flight, Time magazine declared the three astronauts “The Men of the Year” of 1968. The picture was credited with helping to launch the environmental movement. “Earthrise” became a symbol of the movement and led to the first Earth Day on April 22, 1970. It was a flight of firsts: the first American manned flight to leave Earth’s orbit; the first flight to travel that far, a total of 240,000 miles; and the first flight to orbit the moon, after capture by the gravity of another heavenly body. These accomplishments awoke mankind to its own infinite potential. He handed the Bible to Lovell, who read the next section of Genesis. 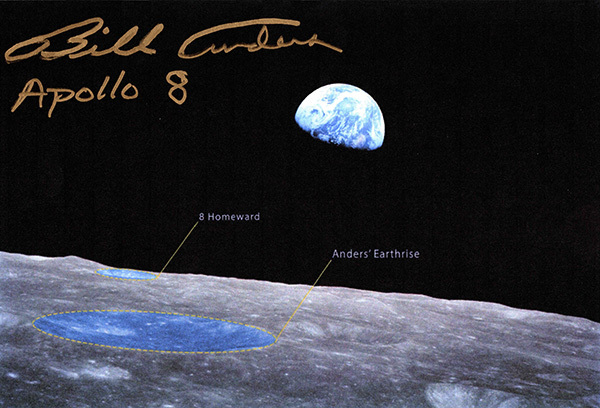 On the occasion of the Grossmont High School Museum’s grand opening in October 2008, Anders donated a copy of the “Earthrise” photo with an inscription, which is displayed above the Apollo 8 flight memorabilia. Anders and his iconic photo also recently received some stellar recognition. The Working Group for Planetary System Nomenclature of the International Astronomical Union has today officially approved the naming of two craters on the moon to commemorate the 50th anniversary of the Apollo 8 mission. The names are Anders’ Earthrise and 8 Homeward. The newly named craters are visible in the foreground of the iconic “Earthrise” color photograph. For more information about the Apollo 8 flight, we recommend “Rocket Men,” written in 2018, by Robert Kurson. To learn more and to see first-hand our collection of NASA memorabilia belonging to our three astronauts, please visit the museum from noon–3:30 p.m. on Dec. 5 or by appointment on other Wednesdays. To explore our 98 years of Foothiller history, visit foothillermuseum.com. Contact: ghsmuseum@guhsd.net or 619-668-6140. —Connie and Lynn Baer write on behalf of the Grossmont High School Museum.